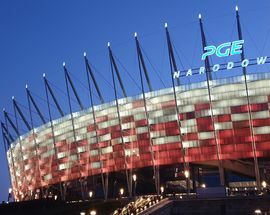 Officially opened on January 29th, 2012, PGE Narodowy (formerly known as the National Stadium) has room for 58,000 fans and 860 journalists, and has become one of the most popular places in PL - visited by 140,000 people each month. 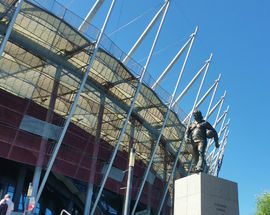 The construction itself, with its red and white covering, was built using hundreds of 45-metre support pillars driven into the ground to stabilise the 25 metres of war rubble the stadium finds itself atop.Priced at 1.2 billion PLN, history buffs will note that the Socialist era ‘Relay’ statue at the entrance has been preserved in a nod to the site’s past heritage – it was here that the Stadion Dziesięciolecia (10th Anniversary Stadium) stood, built in the 1950s to mark the anniversary of the end of WWII. 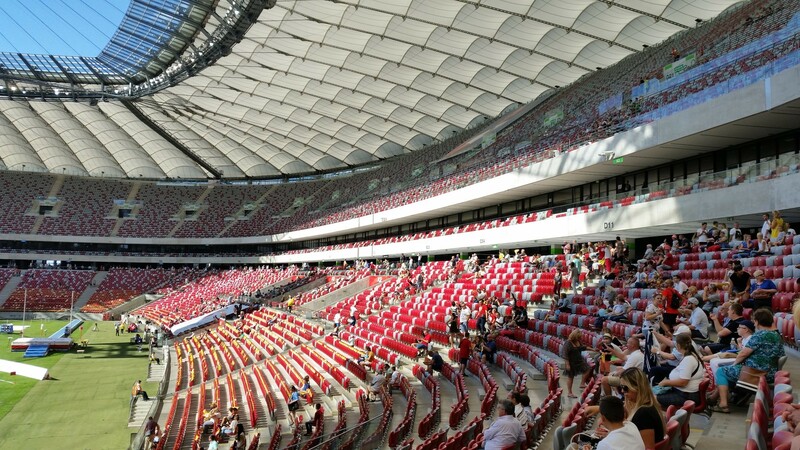 This was also the site where, on September 8, 1968, in front of 100,000 people, Ryszard Siwiec set himself alight in protest of the Soviet-led invasion of Czechoslovakia. 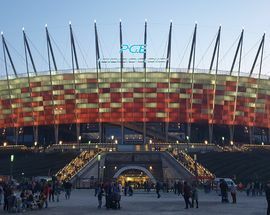 Today Warsaw’s National Stadium can be seen as a shining example of just how far Poland has come since those dark days and is an exceptional place to watch the national football side, or one of the mega-concerts frequently held here (Paul McCartney and Beyoncé have both packed the stadium). 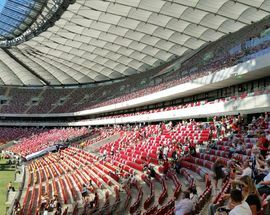 The excellent acoustics provide a deafening atmosphere and the state of the art pyrotechnics are eye-popping. 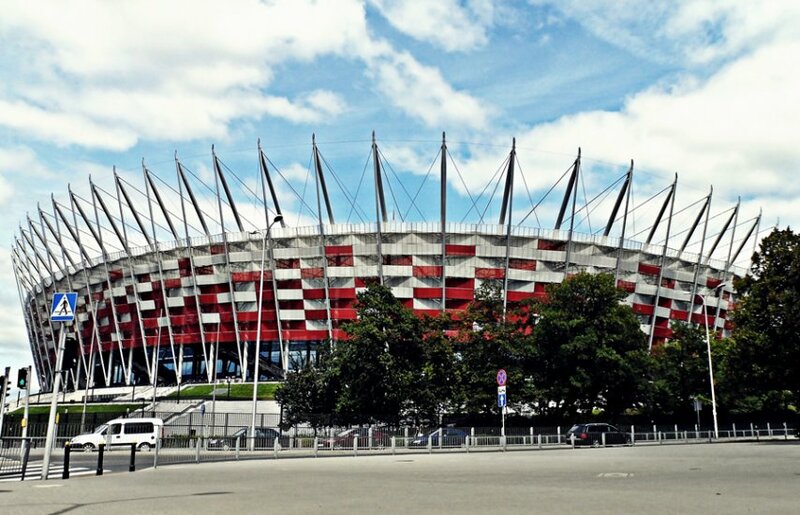 Guided tours of the stadium run 7 days a week, 10:00-19:00 every 30 mins (in Polish). 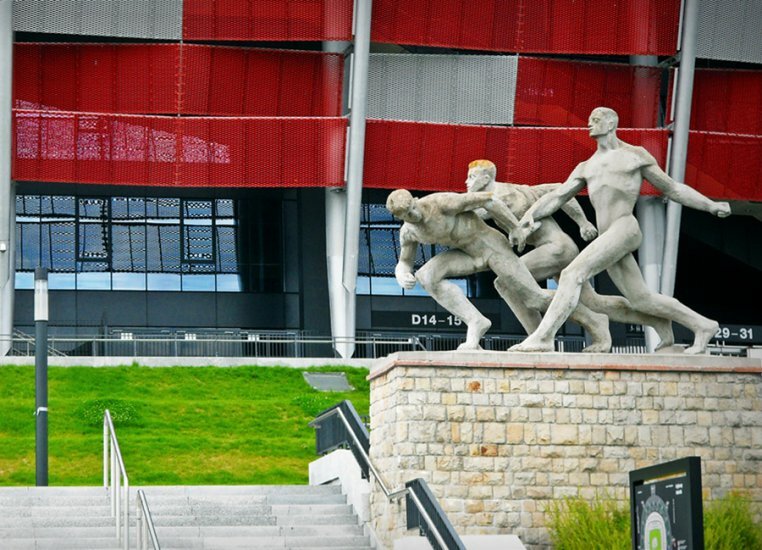 English tours conducted every hour during the week between 10:00 - 19:00 once a day on Sat/Sun at 12:00, 14:30 and 17:00. 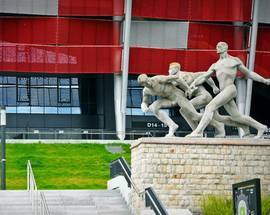 French, German, Italian, Russian and Spanish tours take place by prior arrangement only (call/email ahead), costing 27/17zł. 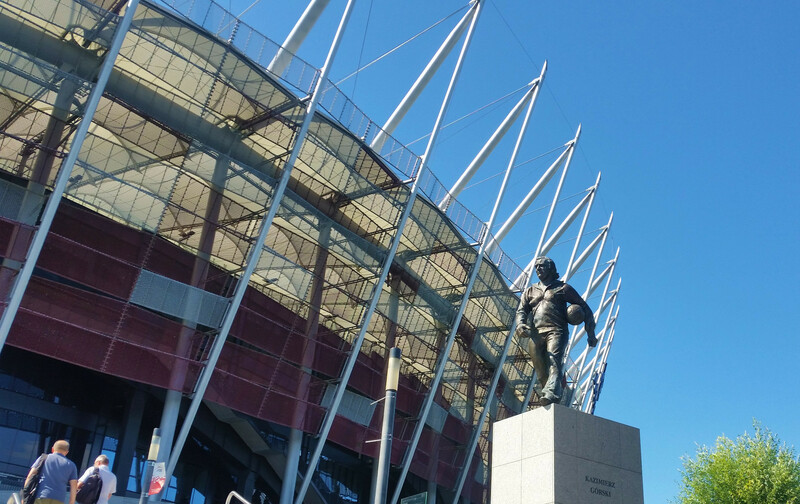 A number of other tours are available, including the ‘Exclusive Tour’ which gives you access to the public spaces as well as players’ only zones and VIP areas. 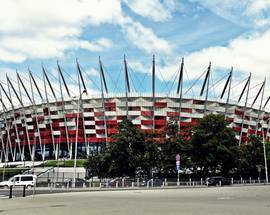 All tour info can be found on their website by clicking on your preferred language option (flag) https://wycieczki.pgenarodowy.pl. 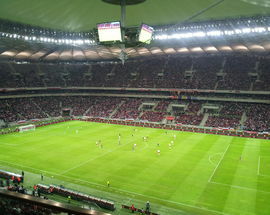 The stadium is approximately 3km from the area around the main train station and Palace of Culture straight along Al. 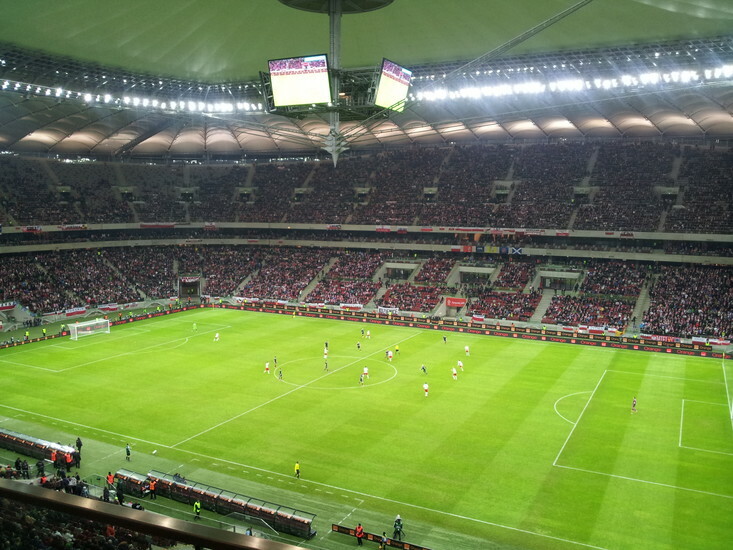 Jerozolimskie and can be reached quickly and easily either by train, metro, tram, bus or taxi. 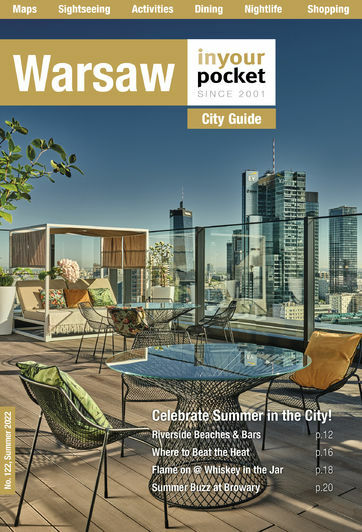 Take a train or tram from outside of the Marriott hotel/Main Railway station or take the local commuter train from the Warszawa Śródmieście station located close to the main station (Warszawa Centralna).